The authors of "Romantic Deception - The Six Lies Men Tell!" 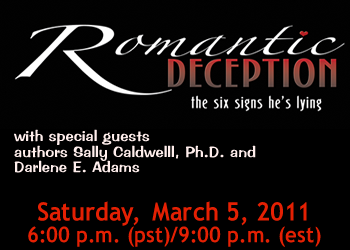 Dr. Sally Caldwell and Darlene E. Adams join host Deborrah Cooper to discuss deception in intimate relationships and the deceptive behaviors men display towards single women, and how a woman might recognize (early!) the signs that her new partner is not being honest. Call in to 347-327-9215 to ask questions or participate in the discussion by phone.